Today’s Flying Spur, which Bentley describes as a “four-door Grand Tourer,” is a little over 17 feet long, a staggering 77.8 inches wide and over 5,400 pounds ready-to-drive yet is still capable of cruising at almost 200 mph according to its spec sheet. A 616-horsepower W12 can make that kind of magic happen. The current car pretty much looks like a longer version of the Continental GT; it’s somewhat sleek hood is not typically seen wearing an ornament. No, the Mulsanne is the Bentley sedan with more of a retro air of aristocracy right now, but I wonder if the next flying spur will start leaning that way too. The current Mulsanne most definitely does have a hood ornament, in case you’re wondering, styled a little more old-school than the one that was released today. 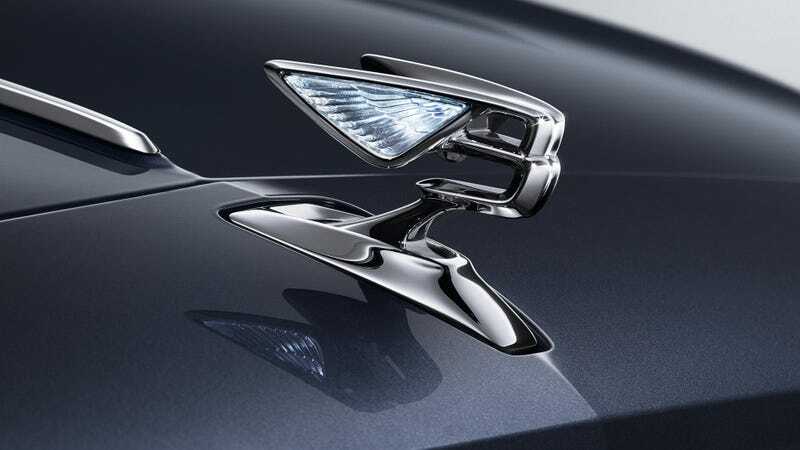 I know the design team at Jaguar, and I guess pretty much every automaker, would disagree, but I am firmly pro hood ornament myself. at least, when it comes to luxury barges. I’m glad to see that Bentley is on board. Speaking of seeing things, Bentley will only officially say “full details of the new Flying Spur will be released later this year” but I bet they mean the New York Auto Show, so we might see more of the design by the end of this month.